Why has the Bank of England started creating new money to buy government debt again? David Aaronovitch discovers who is benefiting and who is losing from quantitative easing. As part of its response to the Brexit vote, the Bank of England will buy an extra £70 billion of bonds and will create new money to do so. The aim is to stimulate the economy and try to meet the government's 2% inflation target. But will it work? Before this latest round of QE was announced, the Bank already owned £375 billion of bonds, around a quarter of total outstanding government debt. Its supporters say it has brought down borrowing costs for the government and for other investors and has helped to push up prices. 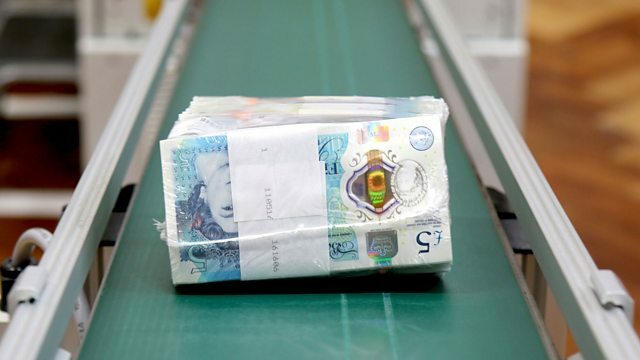 Its detractors say it has caused hardship for savers and has led to pension funds having to compete with the Bank of England for increasingly expensive bonds, which has seen their deficits balloon. In this episode, David Aaronovitch explores how QE works and examines the evidence of its impact so far. Was the Bank of England right to return to the policy following the EU referendum? Will it ever be unwound? Martin Wolf examines how the search to revive growth is testing the norms of economics. Paul Johnson asks if the government should break pledges made to pensioners.